Can I ride here? How to ride electric scooters safely in DC, Arlington Co., and Montgomery Co.
Want to zoom around your area one of those electric scooters? Here's what you need to know. Arlington County announced Wednesday that they’ll begin a nine-month demonstration program to evaluate dockless bikeshares and scooters in the area. Dockless electric scooters have been in the news in recent days, after a young man died while riding one in DuPont Circle when he was hit by a car. In a statement, County Board Chair Katie Cristol acknowledged that one scooter company was already placing scooters in the area. Now, they’ll be offering a demonstration program beginning in October. For a one-time fee of $8,000, scooter share companies can place up to 350 devices at a time. Based on performance, they can request to up that number by 50 with a 750 scooter cap. 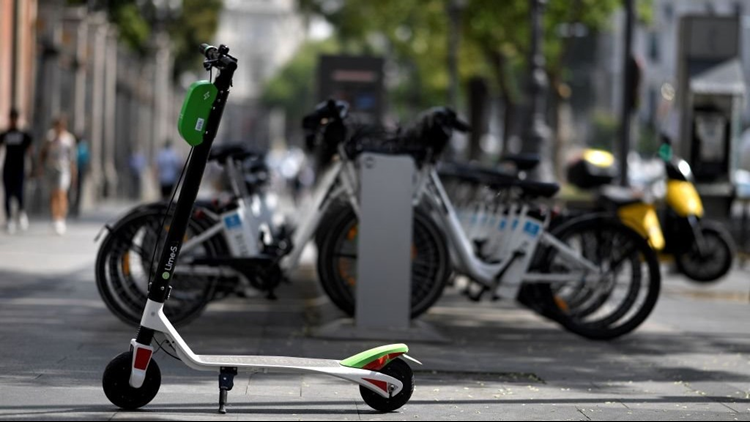 The scooters are privately-owned and thus, residents who want them removed from their private property or on sidewalks, must contact the company responsible directly. The county asks people not to park scooters in travel lanes, blocking walkways, blocking driveways, or at entrances at buildings. They also say there is no regulation that prohibits you from riding them on the sidewalk. However, off-street bicycle paths may not be used by electric scooter riders. Wearing a helmet is not required by law for anyone over 14, but they are recommended. In D.C., electric scooters recently got a new law: they, in addition to dockless bikeshares, must be docked. This means that they must be locked onto bike racks. VERIFY: Can you ride an electric scooter on DC sidewalks? According to MPD, there are no laws to prevent you from riding scooters on the sidewalk. However, there is one area called the "Central Business District," where you have to ride in the street. That area includes Foggy Bottom, the National Mall, the White House and George Washington University. You have to be at least 16 to ride, but you don’t have to wear a helmet although it’s recommended. Montgomery County is currently in a demonstration period with dockless bikeshare companies. All devices must be parked in places that do not block pedestrian or vehicle access. They must be parked on public sidewalks or at bike racks, but not in a way that they are an obstruction. A map is available of preferred riding/parking areas.